I’ve been sent a few books lately about diagnosing Autism / Asperger’s in girls and women. 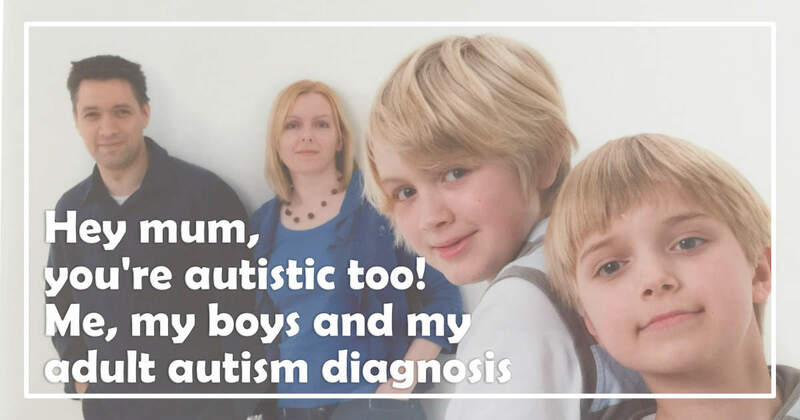 If you’re a regular reader, you’ll be aware that it’s something I already know quite a bit about, having alluded to, if not directly written about, receiving my own diagnosis of ASD in the recent past. Medical practitioners no longer diagnose ‘Asperger syndrome’ but just include it along the Autism spectrum, but as I predicted then, it doesn’t mean it’s just going to go away. For many, using the term ‘Asperger’s’ rather than autism, makes it easier for people who are not so familiar with the spectrum to understand. For example, if I say, “I have autism,” I have found looks of confusion on people’s faces as I'm not what they imagine autism to look like (I think). Whereas, if I say I have ‘Asperger’s’, more often, I’m finding that people have some clue and understanding of what I’m going on about. Why did I need a diagnosis at my (advanced) age? It’s a valid question and one I thoroughly examined before I went to my GP for a referral. In fact, it’s something I had thought about for many years, but was far too busy raising my boys and dealing with their own needs as children with ASD (and ADD/ADHD) and just as children in general, to think about myself. It wasn’t until, a couple of years ago as teenagers, and blunt teenagers at that, they started to say things like, “Yeah, mum, you're just the same. You have autism as well,” that I began to consider it again more seriously. I mean if your Aspie sons can spot it, it must be pretty bloody obvious. I asked myself what I had to gain by seeking an official diagnosis. Would it help me to understand myself better? Would it help my family understand me more? Would it help or harm my relationship with my husband? A child’s diagnosis doesn’t change who the child is, it just helps them access the services they need. Similarly, a diagnosis for myself wouldn’t change the person I am and, while I don’t particularly need any access to autism-related services, I felt it might help people be less judgmental if I did or said something that was “less mainstream”. What was I like as a child? Any clues? I have a familiar story to many – one of never fitting in, an early diagnosis of depression that has been a lifelong companion (probably from over-thinking) and being misunderstood by my family. An easy target for bullies too. In any case, I had NEVER wanted to be one of the crowd. I had grown up feeling like an alien might, having been deposited on a world full of frustratingly illogical people. But even more that, I felt – feel - ‘apart’ like I am ‘working’ my body, looking out of my eyes, from a ‘control-room’ inside my head (I’m sure I’ve seen something similar in an animated movie). I would be constantly asking myself in a response to any event, “What should I do now? What’s the acceptable thing? It’s a split-second thing, but it means my brain is always churning. And because social just isn't your thing, the 'acceptable' thing you choose is quite possibly not the course of action neuro-typicals would choose. It's usually, however, the most interesting option to an Aspie brain, though often not the most understandable. 'Interesting' depends on your obsession of the moment, be it a thing or even a person you want to find out everything about. Obsessions last until you've exhausted the interesting aspects of it; until the 'need to understand' is satiated. This is why computers feature so much in Aspies' lives- they never cease to provide interesting information in one way or another. A former boss once described my brain as being like a computer – oh, if he only knew! It’s not so much playing a part as taking in all the relevant information and consciously deciding the appropriate action. This is the same thing that everyone does, but they do it automatically, naturally. It’s not natural for Aspies and can make them seem rigid and inflexible. If my ‘control room’ is closed, for example if I’ve had a glass of wine or several, or if I’m tired or unwell, all bets are off. Over the years, my control room has developed a great tolerance to alcohol and pain, but fatigue is still something that can cause it to short-circuit, especially if it’s combined with one of the other two. As someone who lives with a chronic pain and fatigue condition, you can imagine how difficult life can be and why I rely on strong pain medication to stay in charge of myself. Even before I was ill, maintaining self-control was always my number one priority. It’s stressful and tiring and, combined with caring for children with special needs, means that you are constantly on your last nerve. When I lost my temper with one of the boys when they were younger, or thought I had made a faux-pas, I would lie in bed at night, turning it over, evaluating what I did wrong and how I could do it better next time – a constant quest for self-improvement that neuro-typical people perhaps do not experience. When you don’t always trust your own judgement, it’s easy to be influenced by others, often in an attempt to fit in at school or work. However, you can often misunderstand their motives. The ‘influencer’ will automatically have a more sophisticated understanding of the complex social or work ‘politics’ at play, while you are blind to these hidden nuances, even if you’re otherwise an intelligent person. This, in turn, has the potential for leading to dangerous or inappropriate situations that you are ill-equipped to negotiate. It can be a hard lesson with a learning curve that may well take decades or a lifetime to learn. I’m speaking here from personal experience and it took becoming chronically ill for me to slow down long enough to grasp this. Since then, I have learned never to trust anyone’s judgement above my own. I am more comfortable in who I am and what I believe. I’m confident that I have opinions that are valid and a voice to express them. That’s not to say I always get it right, but at least I can only blame myself. When you have an autism spectrum condition, learning by experience is everything. For me however, it’s not just age that has brought confidence, it’s the journey of having raised children with needs and having my own painful illness. I care less about what anyone else thinks of me and this has been very freeing. I’ve never been one to give up before I reached my goal, whatever that was. My autism, along with my upbringing, has given me a dogged focus and single-mindedness to keep moving forward, no matter what. Like many with Asperger’s/ASD, I have a deep need for fairness – it’s what drives me to promote it in our SEND community. It’s not that I don’t feel empathy for others, but I have learned to express it appropriately, from carefully watching those who have lots of it. Feeling others’ emotions is too uncomfortable, so I separate myself from it, learned especially from coping with childhood trauma and witnessing trauma in adult family members. I do feel empathy with my children – though it is painful to allow – but on the whole it’s an intellectual concept learned as one would learn a different language. I understand others’ pain or sorrow; I just don’t want to be overwhelmed by it because then I would be no use to anyone. How hard was a late diagnosis to get? When I decided to seek a diagnosis, I anticipated a lot of explaining to my GP. I was wrong. My GP has known us for a number of years. She has seen my battles to get help for the boys and witnessed my struggle to secure support for my current chronic, little known condition. So when I broached the subject of an autism referral, she didn’t question me. At all. She already knew. A referral to our county’s Adult Autism Service followed. It is a long, long waiting list though not as long as the wait for autonomic testing, I have to say. After eight months, I had a call to say they had a cancellation for the following day and could I come? I could. In a way, it was better this way – no stressful waiting period for an upcoming appointment. No worrying about what I would say or what I would be asked. I was emailed a questionnaire about strengths and weaknesses to complete and take with me. The appointment itself was with a psychologist who sees people like me every day. We had a three-hour conversation, with my husband joining us for the last part. We discussed my life up to that point, my responses to things, my sensory sensitivities – noise, smells, light, textures – you name it, I have it. Life is a series of sensory obstacle courses that most people don’t even notice. Some of the questionnaires I completed during the session were clearly designed for children – it seems that diagnosing adults has not yet caught up in this area. However, even before I’d completed the sensory questionnaire, the psychologist was ready to diagnose. I must stress this was MY experience. Autism diagnostic services where you live may be different. All you have to do is be honest about yourself. It has taken me quite a while to decide to write about this. For once, I was lost for words. 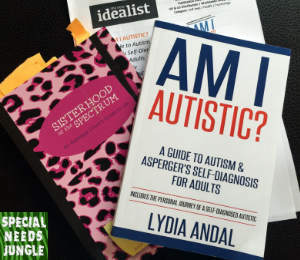 Having being sent the two books, I decided to write this article as I know there are lots of other adults - other parents - with undiagnosed ASD out there who it might help. How did I feel when I got the diagnosis? When I got the diagnosis I expected to feel relieved. But instead, I felt sad and somewhat numb. Sad because I never had anyone rooting for me like my boys have. No surprise, given it was 40 years ago of course, but still. How different would my life have been if there had been more understanding about the kind of person I was? Instead, I was always pigeon-holed as quiet, shy, lacking confidence with a very weird sense of humour. Or not having a sense of humour at all. Instead, I grew up the outsider, never one of the popular girls (not that I wanted to be, they were all extremely dull) I learned to be self-reliant, never needed lots of friends to entertain me, had a rich imagination and vivid dreams. I was also wracked by anxiety and expected not to be liked, both of which continue to this day. Although SNJ is a popular and respected blog, I don’t feel I am ‘loved’ as a blogger. I don’t – can’t – play the personality game. And that’s okay. I’m friendly but reserved. I like recognition for the things I do, but even more want everyone who contributes to be recognised as well. It’s fair. Fairness is the most important thing. Would I recommend other adults who suspect an ASD to seek a diagnosis? I can’t speak for anyone else. Now I’ve lived with it for a while, I’m glad I did. I helps me understand myself and perhaps it has helped others understand me. Do people doubt my diagnosis? Not to my face, but if they do, I would hope they would think their doubts stem from their lack of knowledge of autism rather than the veracity of my diagnosis. Who knows, perhaps someone reading this may even feel bad for judging me harshly in the past. In any event, that’s their problem, I don’t hold it against them. Being unforgiving is for losers – in so many different ways. The support of my family and their acceptance of my diagnosis has been the most important thing. On top of this, making time for meditation helps. Often I just fall asleep during it, but there is always time at the beginning to just clear my mind and open my consciousness to beyond my daily reality. It’s very centring and helps anxiety melt away. If you think you may find this impossible, you can use guided meditations such as from The Monroe Institute. These are an excellent way to get started and you can focus on particular issues. Ultimately, you can see therapists for as long as you like or can afford, but lasting change and acceptance has to come from within. Such an informative post and something I can relate to – since we’ve been going through the assessments with my 4 year old my parents have said that if there was the help and support and also knowledge like we have today back in the 1980s and 1990s they would have definitely have taken me to the GP, I was therefore labelling as ‘painfully shy’ with a facial palsy and diagnosed with Bi Polar in 2008, now my child is starting school I’m wondering if I should take the important trip to the GP and ask about a referral for myself, I’ve finally accepted myself for who I am after 30+ year but what a diagnosis would do would answer the questions I’ve had for so many years. I can completely relate to the ‘what should I do now’ and ‘what’s the acceptable thing to do?’ I have had this since I was a child, and I’ve taught myself how to show emotions to others and also what is acceptable to do in situations like eye contact as I still find this painful when I meet new people. Thanks so much for your comment Nicola. It took a good while to be ready to write it – I was surprised how I felt afterwards. But I would encourage you to go to the GP for a referral if you feel this will help you (and your family) understand you better. I did feel it answered many questions, particularly about during my teen years. I know what you mean – my boys are now 18 and 17 so I waited as well. Take your time, but do go for it – it’s only a piece of paparr but somehow it matters. Thank you so much for sharing your personal story. I believe there are many undiagnosed adults out there and a diagnosis can be enabling whatever your age. You continue to inspire others with your writing. Thanks Jen, yes, I agree with what you say. It explains a lot of my teen behaviour too – even though that was loooong ago, somehow it makes a difference. Thank you so much for writing this, it helps so much to realise I am not the only one. Once I knew my older son was autistic I spent a long time wondering whether I might have autism too. Finally I saw a psychiatrist as social services were involved with my son and insisted that I was assessed for my mental health. It was this psychiatrist who said I was not mentally ill (just very stressed over trying to get support for my son) but that I had autistic traits. I then went on to be officially diagnosed with Aspergers and I am so glad I did as I now have an explanation for my difficulties and I can finally accept myself for who I am. Thank you! This article related to me more than any other I’ve read. My grown son found his own answers after hard experiences in life, and sought his own diagnosis. His adult younger brother followed–there had at least been some hint of autism in his young life, but when I had asked his pediatrician back then (the late ’60s), all the answer he had was, “some children just more rhythmic needs than others”. After sitting in on both my sons’ adult diagnoses in order to give whatever help I could, it hit me like a lightning bolt–we were talking about ME, too. Since then, I haven’t been inclined to seek my own diagnosis, as I’m 77 this year, and no longer have career or schooling issues to deal with, and I have absolutely no doubt that my own recognition is valid. (I’m not against diagnosis at some point, but just see no real need to spend the money.) My own life since this discovery has been a revelation. So many of the things you mention–the memories, the experiences, so reflect mine that I could have written the article myself. When I was in grade school, I was selected to be on a radio quiz show, and the first subject was “animal genders”–they named the male, we named the female. At my turn, they said, “stallion”. Now of course I knew a stallion was a horse. But . . . wait! Was a stallion a particular sort of horse?, I asked myself, standing there looking completely clueless. (My grandfather was at home, yelling “Mare!” at the radio!) All my life I’ve tried to find how to describe to people why, no, I would NOT be good on Jeopardy, because . . . well, because . . . and not really having the words to describe why. But I absolutely knew. I’m at peace with my life as it is now, and can spend more energy on trying to help my older son, who has had and continues to have greater life issues. But having these answers for my own life and the choices and behaviors I was always pondering from my past, has given me a self-acceptance that I never would have known without my lightning-bolt second-hand “diagnosis”. I had wondered if many others discovered themselves in that way. Thanks for your comment. Luckily, a diagnosis in the NHS is free as long as you can wait. I’m glad my story has helped – I suspect there are many women like us out there, all feeling they are alone and a little bit ‘less’ in some way, because everyone else seems to find the world an easier place to be. We do everything we can for our kids, getting them the help, while always knowing this is us too, and being determined our children will get the understanding we didn’t. Thank you for your very informative article. After my son was diagnosed as a non-verbal autistic, I was constantly reminded by doctors to watch my daughter’s behavior and keep them informed of any signs of autism. I read and read, constantly trying to look out for my children’s best interests. However, I must admit that in the last two years since my son was diagnosed, I have been more suspicious of my own neuro- diversity than my daughter’s. I grew up the chronically ill, depressive scapegoat of my family. I tried hard to fit in but I was still my mother’s ” hardest burden”. I was prone to maladaptive daydreaming, socially incapable of making female friends, and constantly being bullied or sucked into narcissistic friendships. In my adult life, my husband and children are my pride and joy. I only have a few friends, because of my odd sense of humor and family commitments. My extended family isn’t around anymore, I was promoted to “lying black sheep” years ago, even though I truly detest dishonesty and couldn’t lie to save my life. My childhood would probably have gone a lot easier if I could’ve. It would be incredible to get myself tested in the future when our appointment calendar isn’t so overloaded. Thanks again for sharing your story!